When we digest food, it goes from the stomach to the intestines. On some occasions, the food that should be digested and sent from the stomach to the intestines goes in reverse and the contents of the stomach travel back up the esophagus. This is known commonly as heartburn. Acid reflux, sometimes known as Gastroesophageal Reflux Disease (GERD), is this abnormal reflux of the stomach contents traveling up into the esophagus. This condition mostly affects adults but has also sometimes been diagnosed in children, even as young as infants, although this is rare. The primary symptom of Acid Reflux that most people will notice is heartburn. The problem must be treated fairly quickly as it will usually only worsen. The secondary symptom that the majority of people will notice is regurgitation, which is when the food from your stomach will travel all the way up to your mouth. You may then experience an increase in chest pain and have trouble swallowing food. This is commonly followed by suffering from asthma, and, as a result of the acid moving upwards into your mouth, you will begin to notice problems with your teeth as the acid begins to erode them. With this in mind, it is important to get Gastroesophageal Reflux Disease treated at first sight of the earliest symptom. While there is a cure for heartburn, it is easier to treat the earlier that it is diagnosed. WHAT ARE THE CAUSES OF ACID REFLUX AND HEARTBURN? Heartburn is described by most as a burning sensation in the chest area. This sensation is caused by stomach acid secretion traveling upward toward the throat. Lots of people will get heartburn from time to time, and often for an unknown reason. Some people may experience frequent heartburn and others may only experience occasional heartburn. Everyone is different. Certain foods, such as coffee, alcohol, chocolate, or fatty or spicy foods. The heartburn sensation that is caused by acid moving upward through the esophagus can be treated with various therapies and surgical techniques. The symptoms of GERD are usually treated initially with over the counter medications such as antacids to soothe the symptoms, and will usually be accompanied by a change in diet. Many people find that switching to a healthy, balanced diet is enough to cure heartburn. Avoiding things such as caffeine, soda drinks, and fried foods can have a positive effect on the body and prevent the symptoms of GERD from recurring. It has also been found that stopping smoking can lead to the prevention of acid reflux symptoms from occurring. Antacids are the most common treatment for symptoms of reflux disease, and these can come in two forms: liquid and tablet form. Many people would rather opt for the liquid form of antacids as this tends to be much easier to consume. To avoid damaging the stomach, antacids must be taken shortly after eating. Simply using antacids for long periods of time can actually worsen the issue rather than cure it, as it simply provides relief from the symptoms and doesn’t actually do anything to address the root of the problem. Another way to treat heartburn and symptoms of GERD is through natural methods that focus on improving natural digestive health. Some natural substances such as anise, lavender, and peppermint can cut the amount of acid present in the stomach, thus reducing instances of heartburn. A mixture of these substances in equal amounts can drastically soothe GERD symptoms. It is also important to eat foods that are high in fiber, as well as fruits and non-acidic vegetables to improve the body’s natural digestion. Smaller and more frequent meals have also been found to reduce heartburn. It is important to drink enough fluids to promote digestive health. Water is an excellent choice. Herbal teas are also a great choice, especially for drinking after a meal as they have been shown to relax the stomach after eating. A chamomile tea after a meal is a great choice for promoting healthy digestion. Heartburn sufferers and chronic acid reflux sufferers should also avoid sleeping for at least two hours after eating. The activity of lying down can increase the chances of acid moving from the stomach up the esophagus shortly after eating. Many who suffer from acid reflux have found that simply sleeping on an extra pillow can relieve heartburn in the night, as this raises the esophagus and makes acid less likely to travel in that direction. Most people will try these natural remedies first before consulting a professional. If you have tried each of these methods and still experience an issue, then a professional diagnosis should be in order. Healthcare professionals will usually provide medication that focuses on reducing the amount of gastric acid in the stomach. Medications such as Famotidine and Omeprazole are amongst the most commonly prescribed aids for helping with heartburn and GERD symptoms. Only the most serious cases of acid reflux will require surgery. The standard surgical treatment for this issue is called Nissen Fundoplication. During the procedure, the Fundus (upper part of the stomach) is wrapped 360 degrees around the esophagus. This results in the release of stomach acid secretion being cut off when the stomach contracts. The symptoms of acid reflux experienced vary from person to person. However, there are methods to relieve most people of their acid reflux problems. Even though it is quite possible and easy to relieve the symptoms of acid reflux through over the counter medication and natural remedies, it is still important to seek medical advice whenever your symptoms become uncomfortable to ensure that you get the right treatment needed for you personally. AcidRelief360 is a supplement aimed at improving natural digestive health. It is clinically proven to provide a natural solution for GERD and heartburn. When used regularly, it helps to soothe both the frequency and the intensity of heartburn, which results in long-lasting relief from the condition. The formula of AcidRelief360 is made up of five powerful natural ingredients that create a reliable and lasting treatment for Gastroesophageal Stomach Reflux and also promote digestive natural health. These properties make AcidRelief360 one of the best digestive products on the market. Slippery Elm Bark – This ingredient is known to enhance your metabolic functioning, as well as the functioning of your digestive tract. German Chamomile Extract – This substance is remarkable against acid reflux as it is quite prominent. Aloe Vera – The properties of Aloe Vera has a wonderfully calming and relaxing effect on the stomach and promotes the healthy process of nutrients. Lemon Balm Extract – This introduces many antioxidants into the stomach which battle the damage caused by free radicals. Deglycyrrhizinated Licorice – This increases the production of protective mucus to help restore the integrity of the esophagus, intestinal lining, and the lining of the stomach. The Slippery Elm tree is a native tree to North America whose inner bark is used by many for medicinal reasons. As its name suggests, Slippery Elm is usually slippery due to plant polysaccharides. The inner bark contains a substance called “mucilage”. When you mix mucilage with water, it becomes a gel. These plant polysaccharides in the gel can coat parts of the human body and protect and relieve it from various issues. An example is that it can coat the inner lining of the gastrointestinal tract, which can, therefore, help to relieve symptoms for those who experience heartburn and acid reflux. It can also promote the production of more mucus in the intestines, which can help to prevent ulcers from occurring and can protect against extra acidity. Chamomile is a well-known relaxing herb that is often used to relieve stress and anxiety and creates calming effects within the body. German chamomile is the best form of chamomile for treating acid reflux. It is a very gentle remedy that has no proven side effects. It has been used for hundreds of years to treat various problems and to help relieve stress. Chamomile has been studied and has been found to reduce symptoms of acid reflux, stomach pains, nausea, and cramps. Aloe Vera is a succulent plant that is usually found in warm and tropical climates. It is widely used for a number of purposes including medications, cosmetics, perfumes, and much more. The gel of Aloe Vera is found when you break open its leaves. It is a widely recognized home remedy for a number of small injuries such as scrapes, scratches, and minor burns. It is believed that the properties of Aloe Vera have a similarly soothing effect on those who deal with both normal acid reflux and chronic acid reflux. It has anti-inflammatory properties which are what makes it a great all arounder for treating minor injuries and illnesses. Lemon Balm is an herb that derives from the mint family. The leaves of a Lemon Balm plant are used for medicinal purposes. These leaves have a slight lemony aroma. Lemon Balm can be used on its own or as a combination mixture with other substances. Lemon Balm is mostly used for digestive problems and can help to relieve symptoms such as stomach cramps, flatulence, bloating, and vomiting. Deglycyrrhizinated Licorice (DGL) is a form of licorice that has been processed for safe consumption, and it is used for medicinal purposes. To make DGL safe for long term use, a large amount of a substance called Glycyrrhizin is removed from it. This makes DGL safer for consumption in general -, especially on a long-term basis. DGL is known to increase mucus production which can protect the stomach, the gastrointestinal tract, and the esophagus from acid. The formula of these five ingredients is all natural and can enhance both the digestive system as well as the normal functioning of your body. It can provide fast and effective relief from heartburn problems or symptoms of acid reflux. It can also enhance the functioning of your gastrointestinal tract and colon, resulting in less gas being produced and less acid reflux. AcidRelief360 is a daily medication that must be taken each day to experience the benefits it offers. Pregnant women and women who are currently breastfeeding should avoid AcidRelief360, and those who are taking other medications should consult a healthcare professional before taking this supplement. 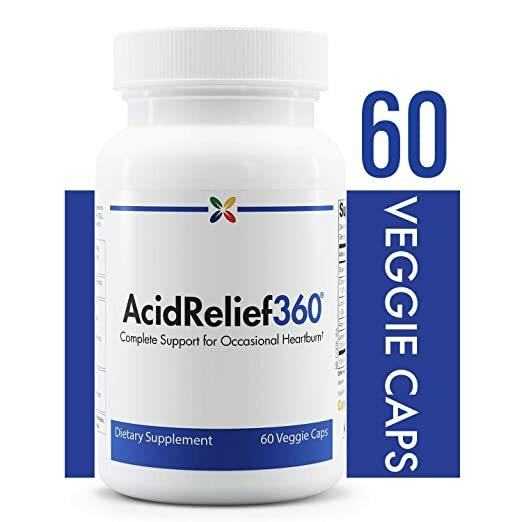 According to AcidRelief360 reviews, there are no serious AcidRelief360 side effects to note. Dyspepsia which means “bad digestion” is commonly known as indigestion, or acid indigestion. As much as a quarter of the adult population in the U.S. are affected by Dyspepsia, a condition that is responsible for a high number of doctor visits. Dyspepsia has many possible causes. Some of these causes are easy to diagnose while others are a little harder. People who suffer from Dyspepsia often experience recurring abdominal pain that is prominent in the upper abdomen, and this usually lasts for more than four weeks. Other symptoms may include bloating, burping, feelings of fullness, and nausea. These symptoms all usually occur shortly after food has been consumed. An example of a natural herbal remedy includes a mixture of honey, ginger and lemon combined with warm water. Drinking this herbal concoction once daily can help to alleviate digestive problems. Another very effective natural remedy for digestive problems is herbal tea. Herbal teas can soothe the digestive system and improve its function. Drinking herbal teas on a daily basis can ensure that you avoid further symptoms of heartburn and acid indigestion. Ginger is a powerful ingredient against indigestion. Using ginger in cooking or eating it raw can drastically improve the function of the digestive system. Eating a small amount of ginger shortly before meals has been proven to reduce heartburn and acid indigestion effectively as well. Apple Cider Vinegar can be used to treat heartburn and acid reflux. The beneficial bacteria in Apple Cider Vinegar and its acidic properties can improve digestion and reduce acid reflux. The intake of too much sugar, alcohol, tea, and coffee can negatively affect the proper function of the digestive system. If you avoid consuming too much of these substances, you will increase your chances of avoiding any digestive issues. Eating more fruits such as bananas, figs, and papaya can drastically improve the natural health and function of the digestive system and can help to deter any future digestive health problems. Spicy foods, fried foods, and foods that are low in fiber should be avoided as much as possible as these can all irritate the digestive system and lead to problems. Foods that are high in fiber and protein will also promote a healthy digestive system, so these types of foods should be consumed the most. Exercise is important for your overall natural health, but can also help with the functioning of the digestive system. Activities such as walking and jogging can help to keep the digestive system working properly and will help you to avoid problems with indigestion. These alternative natural remedies for acid indigestion problems are great as they are a cheaper and act as much more readily available treatments for digestive natural health. Plus, they help you avoid the need to take any form of medication. Oral suspension medications act as a replacement for traditional antacids in the treatment of heartburn, indigestion, diarrhea, internal ulcers, and nausea. This is a liquid form of medication that effectively stops symptoms by coating the inside of the esophagus. Oral suspension medicines can often be short-lived as, once the coating on the esophagus wears away, the symptoms can return. This type of medication is only really suitable for people who experience occasional heartburn symptoms (only a few times per month). Some common oral suspension medications include Carafate and Pepto Bismol. H2 Receptor Antagonist medicines have recently become available over the counter. They previously required a prescription. These supplements work by blocking out H2 receptors on the cells of the stomach. These are the cells that, when stimulated by histamines, generate acid. When H2 Receptor Antagonists attach to these stomach cells, they prevent acid from being produced. This type of medication offers a longer-lasting relief that general antacids, however, they do take longer to take effect. Therefore, you have to take the medicine 30 minutes before eating or before sleeping. H2 receptor antagonists are useful for mild acid reflux, which occurs a couple of times a month. Some common side effects of H2 Receptor Antagonists include headaches, dizziness, diarrhea, and overall tiredness. Some of the most popular brands of this type of medication include Pepcid AC, Tagamet, and Zantac. Proton Pump Inhibitors are very safe and are available both over the counter and as a prescription medicine. Due to this, they are the most commonly used medication for acid reflux. Proton Pump Inhibitors work by shutting down the proton pump system inside of the stomach. This is the part of the stomach that generates acid. Proton pump inhibitors (PPIs) are available in tablets, capsules, powder, and injections. In addition to treating acid reflux, these medications also treat stomach ulcers and Zollinger-Ellison syndrome, a very rare condition related to the stomach. As well as relieving symptoms for acid reflux, PPIs help to heal esophageal stomach tissue that may have been damaged by acid erosion. With this in mind, PPIs should only really be taken by people who suffer from frequent and severe symptoms of heartburn, and not those who only suffer from occasional heartburn. There are some side effects of PPIs to note including constipation, diarrhea, drowsiness, dizziness, stomach pains, and headaches. Some popular brands of PPIs include Prevacid and Nexium (both prescription medications), and Prilosec (available over the counter). There are many benefits to using AcidRelief360 to treat heartburn and GERD. We have highlighted some of the most prominent reasons as to why AcidRelief360 is one of the best digestive products on the market today. It contains those five key natural ingredients that promote healthy digestion and reduces acid production, therefore soothing the effects of GERD. If you are worried about your digestion or if you are currently experiencing frequent heartburn or other symptoms of GERD, it is important to get a proper diagnosis from a doctor. Each person experiences symptoms in a different way and so each diagnosis is different. To ensure you use the right treatment for you, a proper diagnosis from a healthcare professional is always highly recommended.